OK. It isn't furniture. But I did build it very carefully in my shop and I think it is rather nice so here it is. 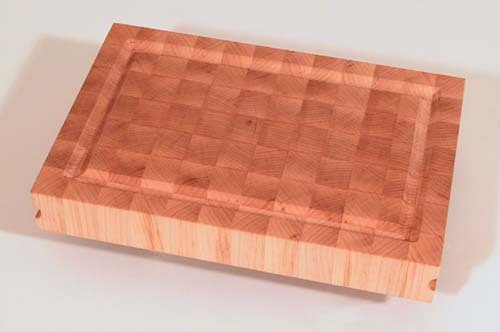 The main feature that sets this board apart from most that are made is that it is an end-grain configuration just like old-fashioned butcher blocks. This orientation makes the board tougher, harder to build, and prettier (at least in my opinion). One of the most difficult parts in making it turned out to be the "blood" groove on one face. Getting a clean cut in this extremely tough material, even with a new and sharp round-nose router bit, was nearly impossible. To balance out this difficulty I discovered that I could either joint or plane the end-grain on my Robland with very little tearout and this saved no end of time. The material is hard maple and it is held together with waterproof polyurethane glue. Finish is with mineral oil. Overall size in inches: 15 X 10 X 2.